Every ordinance or doctrine of the church has a special meaning. To get the full value of each one we (every member) should know why we do them. Each of these has a special meaning and each compliments the other. But, neither will take the place of the other. We want to practice each because the Bible teaches us to. But we also want to understand them so we can obtain the full blessing of each. John, of all those who were present, was the only one that recorded the incident, of Jesus washing his Disciple’s feet. In any study of Jesus’ teaching, the story of that last night of his earthly life must fill a very large place. John alone tells it fully, so much indeed that it practically forms nearly one-fourth of his Gospel. Several key things we want to take note of. 1. Jesus’ love for his disciples prompted it. 2. The foot washing took place immediately after the communion feast. 3. There was friction among the twelve about who should be the greatest among them. 4. Judas was in the process of betraying Jesus. 5. Jesus’ love for his disciples prompted him to teach them a lesson concerning humility. 6. Jesus condescends to the role of a servant or slave. 7. The lesson Peter and all of us learn from this. In the first verse of John chapter thirteen, we are made aware of some of the things which were going on in the mind of Jesus at this particular hour. Jesus knew that the time of his death had arrived. In most cases, this is wisely hidden from us, but he knew the hour and the minute. “He knew his hour was come…” comparatively speaking, he was already within the deadly hour, and had only a few minutes between him and the deadly conflict. He knew the awful circumstances of his death. He knew that it would be by crucifixion, with all its physical pain, public shame, and insult. But the physical suffering and torture were but a faint shadow of his mental and spiritual agony, which could only be known and fully realized by Himself. But in his knowledge, there were some alleviating features. He knew that in his death he would be going home… He had lived in this world thirty-three and one-half years, and he had made some close friends. This last evening and night with his disciples was a cherished moment for him. He wanted these last few hours with them to be a time of intimate fellowship. He had so much to tell them. He wanted to share secrets with them concerning heaven and the coming of the Holy Ghost, but the atmosphere was clouded. The little fellowship came into the room that night divided. In fact, there was contention among them. Arguing and bickering among themselves. Judas was in the process of betraying him, having gone to the High Priests to make a deal with them. It seems that during the supper his mind was made up to do the deed. Jesus used these last few moments with him to give him the opportunity to remain true to him. Jesus, knowing that he could not get their minds on heavenly things as long as there was strife among them concerning which one of them was the greatest, decided to teach them a lesson on humility, this he did in the midst of the feast. In John’s account of it, every word forms a distinct picture. He divested himself of his outer garment. He took off the seamless garment which the soldiers would cast lots for. He laid aside the robe or frock which they were all accustomed to seeing him wear. It was a designation of the office of Rabbi, a distinguishing mark of a Prophet, or Master. Philippians 2:5. “Let this mind be in you, which was also in Christ Jesus. 6. Who is in the form of God, thought it not robbery to be equal with God. He came down from heaven, not just came from heaven, he represented heaven in all of its glory, he was heaven. God manifest (made known) in the flesh. The Almighty became a servant. The Master stooped to serve, to wash his Disciples feet. We do not know which one of the disciple’s feet Jesus washed first, who was second, and so on down the line, but I’m sure that all the bickering ceased, all strife was forgotten, all contentions, all arguments ceased as one by one they had their feet washed by our Lord. No one seemed to say a word, no one offered to relieve him of this menial task he had undertaken until he came to Simon Peter. Peter, always impulsive, never one to be tongue-tied, but always quick to blurt out everything in his mind. This was more, by far, than he could stand. I’m sure, at the first, he stared in a kind of stunned amazement, as though he could not believe what was happening. Peter was sincere, and in this statement was acknowledging the superiority of Jesus over him. Jesus’ reply went far beyond this purely symbolical washing, and gave it a moral significance. “This is a symbol of my love to you, and of what is to be your loved one to another; if you refuse to accept it from me, you will then have no part with me in the manifestation of the spirit of self-sacrificing love which I have come to inaugurate.” Peter began to grasp the true meaning of Jesus’ statement and he reacted more forcibly. Simon Peter suddenly felt the weakness and sinfulness of the old human nature and he cried out for the Lord to cleanse him entirely. 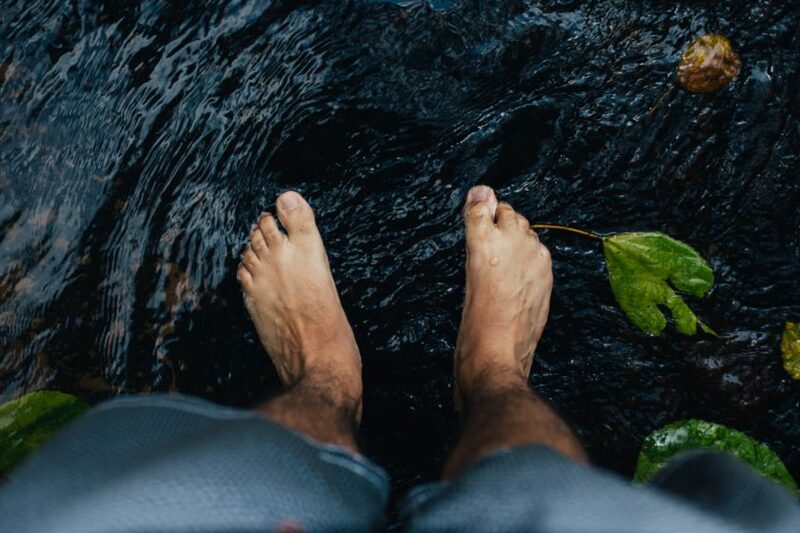 Jesus’ answer to him shows that he is speaking of something far more important than the foot washing. Foot washing has a deep spiritual meaning which we need to understand also. They had been washed (baptized) from the defilement of their old nature, they had undergone a thoroughly moral and spiritual change by their union to Christ. They were reconciled and cleansed; they did not need a fundamental change to be wrought daily. Just as a man, who had a good bath, only requires the removal of the soil contact in the daily walk. So is a man who has been regenerated and washed by the blood of the lamb, is forgiven and clean, need not a total regeneration, but a daily cleansing of his trespasses. 13. Ye call me Master and Lord: and ye say well; for so I am. 15. For I have given you an example, that ye should do as I have done to you. 16. Verily, verily, I say unto you, the servant is not greater than his lord; neither he that is sent greater than he that sent him. In this act of Jesus washing his disciple’s feet, we see a manifestation of God. God was manifested to men not only in the words, but in the life of Jesus, and in no other way could he have been more fully revealed. The example is in principle more than in the specific act. The example is to be a token of humility, condescension, love, patience. It is something that is to be constantly imitated by all true disciples. It is to be done by all Christians one to another. Every day some opportunity of washing someone’s feet come our way, maybe not literally, but some opportunity of rendering service of some kind or other to those with whom we associate. The true Christian follows his master example and will take advantage of such opportunities. Remember he took the form of a servant, and he lived the life of a servant.